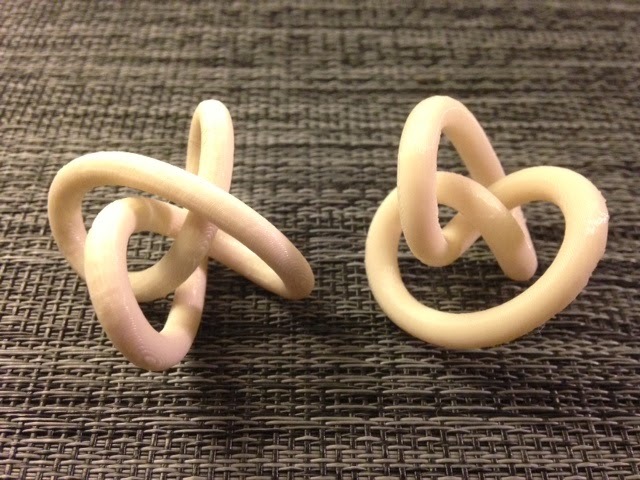 Continuing our collection of trefoil knots, today we printed a trefoil in a Fourier-(1,1,2) knot conformation and a trefoil knot in a tritangentless conformation. In other words, the first trefoil knot in the picture below is a curve traced out by a collection of cosine functions (1 in the x-coordinate, 1 in the y-coordinate, and 2 in the z-coordinate), and the second has the property that no plane is tangent to three places on the curve at the same time (making this a rocking/rolling knot as seen on Day 110). Settings: MakerWare .3mm/low in 20-25 minutes per knot, with the minimum-support custom slicing profile for knots described on Day 110. These equations are from the paper Torus knots are Fourier-(1,1,2) Knots by Jim Hoste at Pitzer College. Here a, b, c, d, p, q, r, and s can be any real numbers, and n, m, j, and k are integers. If d=0 then the parametrization is said to be a Fourier-(1,1,1) knot, which is also known as a Lissajous knot. It is known that torus knots do not have Lissajous parametrizations (for more information see this page from Lee Stemkoski at Adelphi University). The tritangentless conformation is a variant of the parametrization of the trefoil that appears in the paper Trefoil knots without tritangent planes by H.R. Morton at the University of Liverpool. For more information see Day 110, and for the explicit equations see the OpenSCAD code below. Technical notes, OpenSCAD flavor: The code below was based on kitwallace's code from his Rolling Knot on Thingiverse. It's slow to render with F6, taking nearly a half an hour to get a model with step size 3 (which is 120 steps). The code is written so that you can size your knot before setting the strand thickness, which allows us to scale up models without affecting the thickness of the strand.